Another pristine morning on the water finds lots of bait schools in the shallow waters that Florida has to offer. Nervous baitfish trying to find a safe haven to feed, while the predators are tagging along looking to feed on them. Jigging along the flats can provide some great action for any angler. As soon as the sun comes up, I switch to soft baits. There are so many soft baits on the market….it’s like buying a bottle of shampoo or tube of toothpaste! Which color, type, size or brand works best? That’s always a personal preference and you sure would have a tough time convincing any angler that your favorite works better than his. I have always believed that color is secondary to presentation. Light or dark can make a difference for sure. I tend to try to match color to what is happening in the river at that particular time. If you are new to fishing soft baits, ask your local tackle shop for some advice on the popular colors and types that are being used in your area. Styles are yet another type of which soft lures work best for you. 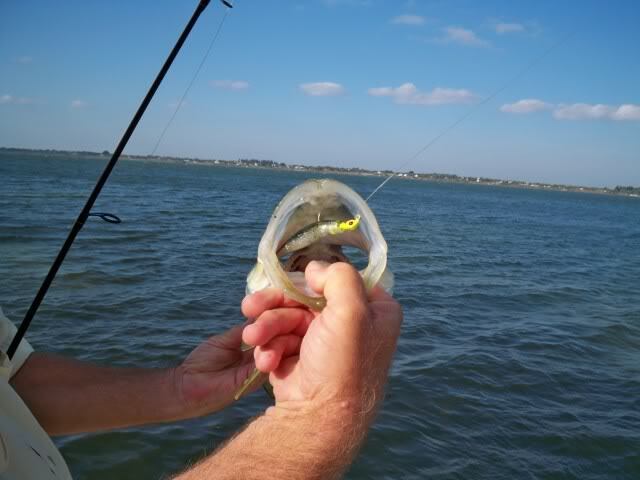 Shad tails, curly tails, jerk baits, shrimp imitations, etc…etc….are all different styles of soft baits and each one has its own kind of action. Some are injected, infected and projected with scents to add as attractants. DOA has always been the choice among most Treasure Coast anglers in this area. It has been my personal choice, too. Pay attention to what kinds of bait are in the area that you will be fishing. I prefer jerk baits when bait schools are prevalent throughout the river. But that’s another topic for another day…. While most soft baits can be rigged weedless and in many different ways, I have always relied on jig heads for my best opportunities of hooking up on fish. Jig heads have been a stickler for me on how they will act in the water. Once again, there are many brands, styles and weights of jig heads. If fishing very shallow water, I like a 1/16th or 1/8th ounce jig, while heavier ones are great for deeper water or windy conditions. The shallower the water, the lighter the jig head is my creed. I pay particular attention to the way the jig is made and what it does when you are working it. Where the eye of the hook is located can suggest what the jig will do when popping it across the grass flats. I look for one that will jump smoothly up and settle back into the grass without latching onto it. The DOA CAL jigs are a great example of the types that are made especially for shallow water fishing. An upward curve to the head and the hook eye situated to allow the jig to jump up from the bottom will make your jiggin’ days’ work much better and be more productive. Rod tip up…..will give you the edge on jiggin’ the flats. You will automatically have the line pulling in an upward motion and the jig will follow along. Make sure that you are using a loop knot to allow the lure to present a more natural presentation. Work your jig slowly across the grass flats in short pops and be ready for that strike. 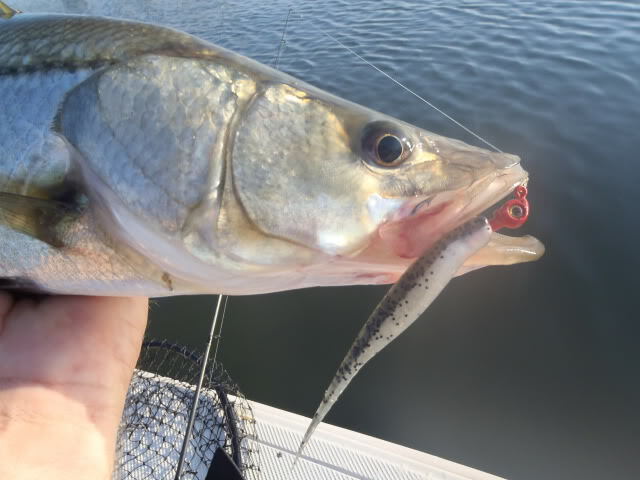 You can find redfish, snook, trout and many more species on the flats that can be tempted by working a jig properly along the bottom. Next time you are looking at jig heads, notice how they are made and how they will actually work in the water. It can help make your day more successful. Have fun jiggin’ the flats!